It’s the quintessential combination of an exhilarating off-road adventure and spectacular scenery. Our exclusive Broken Arrow and Scenic Rim Combo Tour has it all, including winding, unpaved back roads that will have you holding on tight during your journey. This is an experience you’ll surely remember. Start the day by meeting your Certified Interpretive Guide at the Pink® Jeep® Tour Plaza in Sedona, where you’ll hop into a custom-built, open-air Pink® Jeep® Wrangler. Head up Schnebly Hill Road to see towering red rock formations and picturesque views. It was also a filming location for “Johnny Guitar” (1954, Republic Pictures), a movie that starred Hollywood icon Joan Crawford. As soon as you hit the trail, you’ll discover what our vehicles do best—crawl over desert rocks to the most remote areas around Sedona. Hairpin turns, steep cliffs and blind curves await as your Jeep climbs through canyons and washes. The Mogollon Rim is just above you, while the city of Sedona is nestled far below. 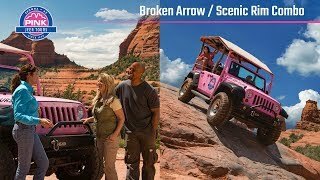 Then it’s on to Sedona’s famous Broken Arrow trail, and only Pink® Jeep® Tours can take you there. Some of Hollywood’s most beloved westerns were filmed here, including Jimmy Stewart’s “Broken Arrow” (1950, 20th Century Fox). A panorama of towering rock spires and unique geological formations gives you a grand sense of scale. Along the way, look skyward to spy Sedona’s White Line; it’s famous amongst thrill-seeking mountain bikers for the seemingly impossible path along a cliff face. The tour’s grand finale is The Road of No Return. Hang on as your guide uses superior all-terrain driving skills to navigate rocks, ruts and roots on your way to the bottom of this exciting descent. Weave your way through the Coconino National Forest and before heading back into the city. If you’re ready to take on the rugged beauty of Sedona’s backcountry, this combo tour is the perfect adventure for you. We’re sure that the scenery and thrills will have you ready for another ride with Pink® Jeep® Tours in no time. Following are real guest reviews, voluntarily submitted and unedited. It was fun. Definitely worth it. The second part was much better. I got car sick (not the drivers fault). Loved it! Told all our friends. Photography is my hobby and I got the best shots! A beautiful day. A lot of fun. We would do it again! Loved it! So much fun. We had a great experience. Josh was friendly and informative. He made food recommendations when we inquired about dinner. He was spot on and it completed the afternoon!! Awesome, we had a Great time! It was fun but not all that. Had a miserable time with the misbehaved kids on the tour. A truly superb experience. The guides make the difference. Would recommend to all. Please Note: Our tours operate rain or shine, provided the roads are open. In the event of severe weather, Pink® Adventure Tours reserves the right to alter, modify, or cancel any tour due to unsafe conditions. Any tour cancelled by Pink® Adventure Tours will receive a 100% refund.